The United Arab Emirates (UAE) has joined other Muslim governments in condemning the publication in a Danish newspaper of cartoons depicting Prophet Mohammad as a terrorist, the Gulf News reported on 30 January. The cartoons have sparked a wave of denunciations and boycott of Danish products across the Muslim world. The publication of the offensive cartoons could spark “a dreadful clash of civilisations,” said the UAE Minister of Justice, Islamic Affairs and Awqaf, Mohammad Nakhira Al Daheri. The statement came as retailers across the Gulf began clearing the shelves of Danish products in protest against the Copenhagen-based Jyllands-Posten newspaper’s publication of the cartoons. “As much as we condemn extremism in every part of the world… we condemn the abuse that was published, which represents a cultural extremism,” said Al Daheri. “We also warn of any unexpected consequences of (such) actions,” he added in a statement issued following a meeting with senior scholars at the ministry. About 50 women marched in Dubai’s Al Mamzar area calling for an end to “all dealings” with Denmark. Cooperative societies and supermarkets in the UAE, Kuwait and Saudi Arabia began pulling out Danish products despite the newspaper’s apology to the Saudis on its website. In a message addressed to the “Respected citizens of Saudi Arabia,” the newspaper said it never intended to offend the religious feelings of anybody. “Unfortunately what happened was not at all a deliberate act,” it said. A few days ago, Saudi Arabia had denounced “certain European newspapers” for cartoons “defiling” Prophet Mohammed, warning that such actions would spread hatred and animosity among people of different faiths, the daily Arab News reported on 24 January. “The Council of Ministers expressed the kingdom’s condemnation of what is published by certain European newspapers defiling the prophet Mohammed,” the Saudi daily quoted the cabinet as saying in reference to cartoons almost four months earlier in Denmark and Norway. Arab News quoted also the largest political Muslim grouping, the 57-member Organization of the Islamic Conference, as saying that it condemned the printing of the provocative cartoons. 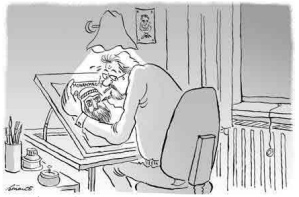 In September 2005, Denmark’s Jyllands-Posten newspaper ran an article about freedom of speech centring on the issue that artists were unwilling to illustrate the Prophet without remaining anonymous for fear of extremist attacks. The paper accompanied the article with 12 depictions of the Prophet by various Danish illustrators. In one of them, the Prophet is shown wearing a turban shaped as a bomb. Later, a Norwegian Christian magazine published the controversial caricatures. Islam does not allow the depiction of Prophet Mohammed, even if they are respectful, because of concerns that it could lead to idolatry.